Burkina Faso is located in west Africa. It is surrounded by six countries: Mali to the north, Niger to the east, Benin to the southeast, Togo and Ghana to the south, and Côte d'Ivoire to the southwest. It has a total area of 274,200 km2 (105,869 sq mi) with an estimated population of 15,746,232 in 2009. Formerly a French colony, the country was established under the name of the Republic of Upper Volta in 1958 and achieved independence in 1960. 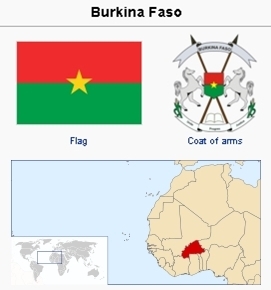 It was renamed Burkina Faso in 1984. Burkina Faso's population belongs to two major West African cultural groups—the Voltaic and the Mande. In 2006 it was reported that 60.5% of the population practice Islam, and that the majority of this group belong to the Sunni branch. The government also estimated that 23.2% are Christians (19% being Roman Catholics and 4.2% members of various Protestant denominations), 15.3% follow Traditional indigenous beliefs, 0.6% have other religions, and 0.4% have none. Many Muslims and Christians still observe ancient animist rites. Mennonite Central Committee (MCC) began work in Burkina Faso (formerly Upper Volta) in the early 1970s. The main relief efforts and water projects were located near Djibasso and Tougan in the northwest part of the country. Through MCC contacts with Christian and Missionary Alliance congregations and missionaries, Mennonite missionaries were invited to plant churches in the southwest part of the country. Two couples were sent there by Africa Inter-Mennonite Mission (AIMM) in 1978. They settled in the town of Orodara in the province of Kenedougou. Because of the diversity of language groups in that area, linguists were needed, and the first such team arrived in 1982 and settled in Kotoura, ca. 50 km. (30 mi.) west and south of Orodara. Since 1982 three more couples joined the first linguistic team. Each has entered a new language group. During the 1980s the AIMM mission had expanded to six villages, of which four had church groups meeting regularly with a total of more than 40 members. Several national members gave leadership to their respective congregations. Volunteers for MCC and AIMM workers have strong fraternal ties. MCC has expanded its program into the southern and eastern regions of the country and in 1987 had 20 workers. Lichdi, Diether Götz, ed. Mennonite World Handbook 1990: Mennonites in Global Witness. Carol Stream, IL: Mennonite World Conference, 1990. Mennonite Reporter (1 October 1984). Mennonite World Conference. "2000 Africa Mennonite & Brethren in Christ Churches." Web. 2 March 2011. http://www.mwc-cmm.org/Directory/2000africa.html http://www.mwc-cmm.org/Directory/2000africa.html [broken link]. Mennonite World Conference. "2003 Africa Mennonite & Brethren in Christ Churches." Web. 2 March 2011. http://www.mwc-cmm.org/Directory/2003africa.html http://www.mwc-cmm.org/Directory/2003africa.html[broken link]. Mennonite World Conference. "Mennonite and Brethren in Christ Churches Worldwide, 2006: Africa." Web. 2 March 2011. http://www.mwc-cmm.org/Directory/2006africa.pdf http://www.mwc-cmm.org/Directory/2006africa.pdf [broken link]. Mennonite World Conference. "Mennonite and Brethren in Christ Churches Worldwide, 2009: Africa." Web. 2 March 2011. http://www.mwc-cmm.org/en15/files/Members%202009/Africa%20Summary.doc http://www.mwc-cmm.org/en15/files/Members%202009/Africa%20Summary.doc [broken link]. Mennonite World Conference. "World Directory Directorio mundial Répertoire mondial 2012." Web. 2013. http://www.mwc-cmm.org/sites/default/files/website_files/mwc_world_directory_w_links_minus_cover.pdf. Mennonite World Conference. Mennonite World Handbook Supplement. Strasbourg, France, and Lombard, IL: Mennonite World Conference, 1984: 18. Wikipedia. "Burkina Faso." Web. 2 March 2011. http://en.wikipedia.org/wiki/Burkina_Faso. Rempel, Dennis L. and Richard D. Thiessen. "Burkina Faso." Global Anabaptist Mennonite Encyclopedia Online. March 2011. Web. 22 Apr 2019. http://gameo.org/index.php?title=Burkina_Faso&oldid=121935. Rempel, Dennis L. and Richard D. Thiessen. (March 2011). Burkina Faso. Global Anabaptist Mennonite Encyclopedia Online. Retrieved 22 April 2019, from http://gameo.org/index.php?title=Burkina_Faso&oldid=121935. Adapted by permission of Herald Press, Harrisonburg, Virginia, from Mennonite Encyclopedia, Vol. 5, p. 112. All rights reserved. This page was last modified on 7 May 2014, at 05:57.